Premium Compatible Label Tapes for the Dymo LABELMANAGER 450D printer. Compatible Dymo D53713 S0720930 Black on white 24mm x 7m. 10 x 7m Pack. The Dymo Label Manager 450D printer is a desktop label maker that helps professionals to create customised labels with or without a computer. This professional label printer is very reliable and offers different labelling options to meet day to day labelling needs. The printer measures 215 mm x 245 mm x 85 mm. It features a large typewriter-style QWERTY keyboard with function buttons for easy editing. It allows to preview the labels before one print on the large display. It also has a 1 line 16-character display for easy viewing. An automatic cutter is included for convenience. With Dymo Label Manager 450D Label Tapes different types of labels can be handled by the printer in widths of 6, 9, 12, 19 and 24mm. A USB interface is provided for connectivity. Apart from creating the usual labels, the printer has special functions such as it can create barcodes. The date and time are also displayed on the screen which can be printed onto the labels if required. Users can create dozens of customised labels with 5 heights, 12 styles, 7 fonts, 6 boxes, and 7 background pattern options. This desktop label printer has in built memory by which it can recall the last 15 labels used and save 10 label formats plus 10 labels. The Dymo Label Manager 450D printer is professional label maker by which one can create a large variety of high-quality, self-adhesive labels in different sizes and styles. It is a good combination of high-performance and economical thermal printing with the use of Dymo Label Manager 450D Label Tapes. Q. How many copies can I create from the Dymo Label manager 450D printer? Can you please suggest how can I do this? Select Set # Copies ( number of copies you want ) and then press OK.
Now, you can press the up arrow key to increase the number of copies to print. You can press the down arrow key to begin decreasing the number of copies from 16. After this, press OK. And then, press Print to begin printing. Q. Can I add the date and time to the text on my Dymo Label Manager 450D label tapes using this printer? A. 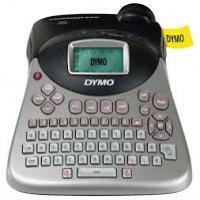 Yes, you can add the date and time to your text on the Dymo Labelmanager 450D label tapes using this printer. You can select from twelve different date formats. The date can be added as fixed text or as variable text that is updated automatically with the current date when the label is actually printed. You can set the time in either 12-hour or 24-hour format. Q. I want to use different fonts to the text on my Dymo Label Manager 450D label tape. Can I do this? If yes, then please guide. A. Yes, you can use different fonts and format styles to the text on your Dymo Labelmanager label tape. For this, you have to insert format breaks to separate the label into sections of text. Each section is partitioned by a format break. You can add two format breaks. This allows one to apply three separate formats to a label. However, alignment, underline, box styles, and background patterns cannot be mixed on a label. These styles are common for the entire label tape. Enter and format text for the first section. Select Insert Format Break and press OK.
Continue entering and formatting text for the next section of the label. Q. As the printer uses thermal transfer technology for printing, will it be able to deliver the durable labels? Will the text quality be good on my Dymo Label Manager 450D label tapes ? A. Yes, definitely. This technology is economical and it produces long lasting results in extreme weather conditions. It is economical to use and it does not required the use of ribbons, toner or cartridges. The technology ensures that ink is embedded deep into the material with heat. So you get the clear and high quality labels. You can use the labels created to organize your garage, basement, kitchen or office in a variety of styles that is suitable to a range of surfaces. Q. How many different tape widths are supported by the Dymo Label Manager 450D printer? A. The printer uses different widths of 6mm, 9mm, 12mm, 19mm, or 24mm. These tape cassettes are available in a large range of materials. Q. Can I cut the Dymo Label Manager 450D label tape automatically or I have to do it manually? Select Set Auto Cut and then press OK. Select On or Off, and then press OK. This setting will remain until it is changed. Q. Does the Dymo Label Manager 450D printer supports barcode printing? A. Yes, the printer does. It can print barcodes in six standard formats: UPC-A, UPC- E, EAN-8, EAN-13, CODE-39, and CODE-128.